is a professor at the school of life sciences at Arizona State University and the author of Fire: Nature and Culture (2012). At night, viewed from space, the cluster of lights looks like a supernova erupting in North Dakota. The lights are as distinctive a feature of night-time North America as the glaring swathe of the northeast megalopolis. Less dense than those of Chicago, as expansive as those of Greater Atlanta, more coherent than the scattershot of illuminations that characterises the Midwest and the South, the exploding array of lights define both a geographic patch and a distinctive era of Earth’s history. Nearly all the evening lights across the United States are electrical. But the constellation above North Dakota is made up of gas flares. Viewed up close, they resemble monstrous Bunsen burners, combusting excess natural gas released from fracking what’s known as the Bakken shale, named after the farmer Henry Bakken, on whose land the rock formation was first discovered while drilling for oil in the 1950s. In 2014 the flares burned nearly a third of the fracked gas free. They constitute one of the most distinctive features of the US nightscape. We might call them the constellation Bakken. While the flares rise upward, the firefront is actually burning downward into the outgassing drill holes as surely as a candle flame burns down its tallow stalk. The flames are descending as rapidly as their fuels are rising. They are burning through deep time, combusting lithic landscapes from the geologic past and releasing their effluent into a geologic future. Eerily, the Bakken shale dates to the Devonian, the era that records the first fossil charcoal, our first geologic record of burnt material. Its gases will linger through the Anthropocene. In 1860 the English scientist Michael Faraday gave a series of public lectures in which he used a candle to illustrate the principles of natural philosophy. Fire was an apt exemplar because it integrates its surroundings, and it was apt, too, because in Faraday’s world, fire was everpresent. Every nook and cranny of the human world flickered with flames for lighting, heating, cooking, working, and even entertaining. But that was starting to change. By then, Britain had 10,000 miles of railways and the US had 29,000. Those locomotives demanded more fuels than the living landscape could supply. Engineers turned to ancient landscapes – to fossil biomass, notably coal – and they simplified fire into combustion. Today, a modern Faraday would not use a candle – probably couldn’t because the lecture hall would be outfitted with smoke detectors and automated sprinklers, and his audience wouldn’t relate to what they saw because they no longer have the lore of daily burning around them. For a contemporary equivalent he might well turn to a fracking flare, and to illustrate the principles behind Earthly dynamics he might track those flames as they burn down through the deep past of fire and humanity. Among the ancient elements, fire is the odd one out. Earth, water, air – all are substances. Fire is a reaction. It synthesises its surroundings, takes its character from its context. It burns one way in peat, another in tallgrass prairie, and yet another through lodgepole pine; it behaves differently in mountains than on plains; it burns hot and fast when the air is dry and breezy, and it might not burn at all in fog. It’s a shapeshifter. By the end of the 18th century, fire tumbled from its pedestal to begin a declining career as a subset of chemistry and thermodynamics, and a concern only of applied fields such as forestry. Fire no longer had intellectual integrity: it was considered a derivation from other, more fundamental principles. Just at the time open fire began retiring from quotidian life, so it began a long recession from the life of the mind. Fire’s fundamentals reside in the living world. Life created the oxygen fire needs; life created the fuels. The chemistry of fire is a biochemistry: fire takes apart what photosynthesis puts together. When it happens in cells, we call it respiration. When it occurs in the wide world, we call it fire. As soon as plants colonised land in the Silurian period about 440 million years ago, they burned. They have burned ever since. Fires are older than pines, prairies and insects. But nature’s fires are patchy in space and time. Some places, some eras, burn routinely; others, episodically; and a few, only rarely. The basic rhythm is one of wetting and drying. A landscape has to be wet enough to grow combustibles, and dry enough, at least occasionally, to allow them to burn. Sand deserts don’t burn because nothing grows; rainforests don’t burn unless a dry spell leaches away moisture. Biomes rich in fine particles such as ferns, shrubs and conifer needles can burn easily and briskly. Landscapes laden with peat or encumbered with large trunks burn poorly, and only when leveraged with drought. As life and the atmosphere evolved, so did fire. When oxygen thickened in the Carboniferous period around 300 million years ago, dragonflies grew as large as seagulls, and fires swelled in like proportion such that 2 to 13 per cent of the era’s abundant coal beds consist of fossil charcoal. When grasses emerged in the Miocene, they lavished kindling that quickened fire’s spread. When animals evolved to feast on those grasses, fire and herbivores had to compete because that same biomass was fodder for each: it could go into gullets or up in flames but not both. Today, ecologists refer to landscape fire as a disturbance akin to hurricanes or ice storms. It makes more sense to imagine fire as an ecological catalyst. Floods and windstorms can flourish without a particle of life present: fire cannot; it literally feeds off hydrocarbons. So as atmosphere and biosphere have changed, as oxygen has ebbed and flowed, as flora and fauna have sculpted biomass into new forms, so fire has evolved, morphing into new species. Yet there was one requirement for fire that escaped life’s grasp, the spark of ignition that connected flame with fuel. Ignition relied on lightning, and lightning’s lottery had its own logic. Then a creature emerged to rig the odds in favour of fire. Just when hominins acquired the capacity to manipulate fire is unknown. But we know that Homo erectus could tend fires and, by the advent of Homo sapiens, hominins could make fire at will. A revolutionary phase-change all around. Until that Promethean moment, fire history had remained a subset of natural history, particularly of climate history. Now, notch by notch, fire gradually ratcheted into a new era in which natural history, including climate, would become subsets of fire history. In a sense, the rhythms of anthropogenic fire began to replace the Milankovitch climate cycles which had governed the coming and going of ice ages. A fire age was in the making. Earth had a new source of ecological energy. Places that were prone to burn but had lacked regular ignition (think Mediterranean biomes) now got it, and places that burned more or less routinely had their fire rhythms tweaked to suit their human fire tenders. Species and biomes began a vast reshuffling that defined new winners and losers. The species that won biggest was ourselves. Fire changed us, even to our genome. We got small guts and big heads because we could cook food. We went to the top of the food chain because we could cook landscapes. And we have become a geologic force because our fire technology has so evolved that we have begun to cook the planet. Our pact with fire made us what we are. We hold fire as a species monopoly. We will not share it willingly with any other species. Other creatures knock over trees, dig holes in the ground, hunt – we do fire. It’s our ecological signature. Our capture of fire is our first experiment with domestication, and it might may well be our first Faustian bargain. Still, ignition came with limits. Not every spark will spread; not every fire will behave as we wish. We could repurpose fire to our own ends, but we could not conjure fire where nature would not allow it. Our firepower was limited by the receptivity of the land, an appreciation lodged in many fire-origin myths in which fire, once liberated, escapes into plants and stones and has to be coaxed out with effort. Those limits began to fall away as people reworked the land to alter its combustibility. We could slash woods, drain peat, loose livestock – in a score of ways we could reconfigure the existing biota to increase its flammability. For fire history this is the essential meaning of agriculture, most of which, outside of floodplains, depends on the biotic jolt of burning to fumigate and fertilise. For a brief spell, the old vegetation is driven off, and a site is lush with ashy nutrients, and – temporarily – imported cultivars can flourish. In 1954, the US anthropologist Loren Eiseley likened humanity itself to a flame – spreading widely and transmuting whatever we touch. This process began with hunting and foraging practices, but sharpens with agriculture. Most of our domesticated crops and our domesticated livestock originate in fire-prone habitats, places prone to wet-dry cycles and so easily manipulated by fire-wielding humans. The way to colonise new lands was to burn them so that, for a while, they resembled the cultivars’ landscapes of origin. Yet again, there were limits. There was only so much that could be coaxed or coerced out of a place before it would degrade, and there were only so many new worlds to discover and colonise. If people wanted more firepower – and it seems that most of us always do – we would have to find another source of fuel. We found it by reaching into the deep past and exhuming lithic landscapes, the fossil fallow of an industrial society. Instead of redirecting or expanding fire, the conversion to industrial burning removed open flame, simplified it into chemical combustion, and stuffed it into special chambers. Instead of being constrained by the abundance of fuels, anthropogenic fire was constrained by sinks, the capacity of land, air and ocean to absorb its byproducts. The new combustion was no longer subject to the old ecological checks and balances. It could burn day and night, winter and summer, through drought and deluge. Its guiding rhythms were no longer wind, sun and the seasons of growth and dormancy, but the cycles of human economies. The transformation – call it the pyric transition – was as disruptive as the coming of aboriginal firestick and fire-catalysed farming, but it was more massive, much faster, and far more damaging. Some landscapes burned to their roots. Seasonally, skies were smoke palls. Frontier settlements vanished in flames. The pyric transition runs through fire history and Earth’s pyrogeography like a terminator. Eventually, as the new order prevailed, as it wiped flame away by technological substitution and outright suppression, the population of fires plummeted, leading to ecological fire famines. The transformation might have left Earth with too much generic combustion, and too much of its effluent lodged in the atmosphere, but the industrialised world also left too little of the right kind of fire where it’s needed. Promoting the steam engine developed with his business partner James Watt, in the late 1770s, Matthew Boulton boasted to the biographer James Boswell that they sold what all the world wanted – power. In 1820, a year after Watt died, Percy Shelley published Prometheus Unbound, in which he celebrated the unshackling of the unrepentant Titan who had brought fire to humanity. By then, the use of coal, and later oil, was liberating a generation of New Prometheans. This newly bestowed firepower came without traditional bounds. For a million years the problem before hominins had been to find more stuff to burn and to keep the flames bright. Now the problem became what to do with all the effluent of that burning and how to put flame back where it had been unwisely taken away. The new energy revolution leveraged every activity, like fire itself creating the conditions for its spread, each reinforcing the other. But the collateral damage in the form of wrecked landscapes could not be ignored. Engineers sought to keep fire within the machines, not loosed on the countryside. Countries, particularly those with extensive frontiers, public lands or colonial holdings, sought to shield their national estate from fire. They set lands aside to shelter them from promiscuous and abusive burning and sought to control fires when they occurred. State-sponsored conservation had considerable currency among progressive thinkers. When Rudyard Kipling wrote ‘In the Rukh’ (1893), a story that explained what became of The Jungle Book’s Mowgli after he grew up, he had him join the Indian Forest Department and fight against poaching and ‘jungle fires’. Only later would the paradoxes become palpable. Only later would overseers realise how hard they would have to struggle to reinstate fire for its ecological benefits. But the flames were only the visible edge of a planetary phase-change. The slopover that followed once Earth’s keystone species for fire changed its combustion habits is best known for destabilising climate. But humanity’s new firepower has a greater reach, and the knock-on effects are rippling through the planet’s biosphere independently of global warming. The new energy is rewiring the ecological circuitry of the Earth. It has scrambled ecosystems and is replacing biodiversity with a pyrodiversity – a bestiary of machines run directly or indirectly from industrial combustion. The velocity and volume of change is so great that observers have begun to speak of a new geologic epoch, a successor to the Pleistocene, that they call the Anthropocene. It might equally be called the Pyrocene. The Earth is shedding its cycle of ice ages for a fire age. The traditional view of North Dakota, as of the Great Plains generally, divides it into humid east and arid west with the border between them running roughly along the 100th meridian. It’s a division by water but it works for fire as well. It also marks a potential boundary between Pleistocene and Anthropocene. For Pleistocene Dakota, look east to the prairie pothole region. It’s a vestigial landscape of the ice sheets. The retreating ice left a surface dappled and rumpled with kettles, drumlins, eskers, potholes, kames and ridges that slowly smoothed into a terrain of swales and uplands. The swales filled with water. The uplands sprouted tallgrass prairie. Those ponds make the region a vital flyway for North American waterfowl. But keeping the wetlands wet is only half the management issue. The birds nest and feed in the uplands and, being clothed in tallgrass prairie, the uplands flourish best when routinely burned. Few of these fires start from lightning; the only viable source is people, who followed the retreating ice and set fire to the grasses. Those fires are themselves relics of a bygone epoch. They annually renew the living landscape that succeeded the dead ice. 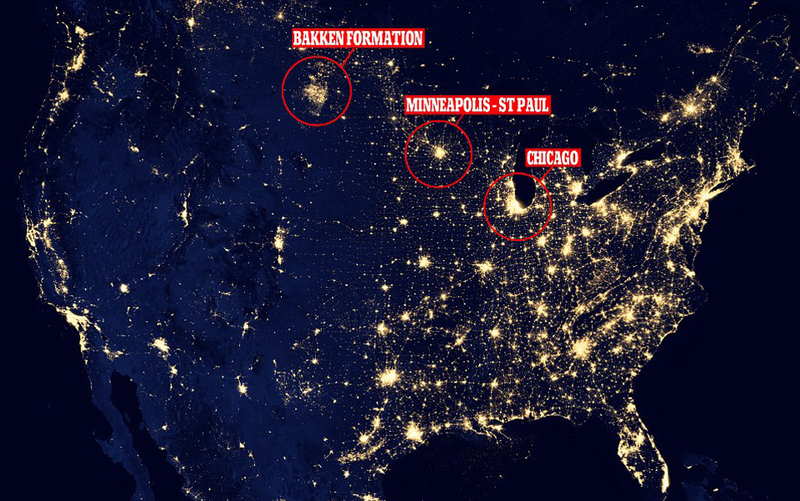 For Anthropocene Dakota, look west to the Bakken constellation. Not only is it a symbol of industrial combustion, but a major source of greenhouse gases and a catalyst for land-use change and all the rest of the upsets and unhingings and scramblings that add up to make the Anthropocene. The flares speak to the extravagance of industrial fire – burning just to burn in order to get more stuff to burn. It’s both a positive feedback and an eerily closed loop that accelerates the process and worsens its consequences. Instead of seasonal waterfowl, vehicles powered by internal combustion engines traverse the landscape ceaselessly. East and west represent two kinds of fires and two kinds of future for humanity as keeper of the planetary flame. One is a Promethean narrative that speaks of fire as technological power, as something abstracted from its setting, perhaps by violence, certainly as something held in defiance of an existing order. The other is a more primeval narrative in which fire is a companion on our journey and part of a shared stewardship of the living world. Sometime over the past century, we crossed the 100th meridian of Earth history and shed an ice age for a fire age. Landscape flames are yielding to combustion in chambers, and controlled burns, to feral fires. The more we burn, the more the Earth evolves to accept still further burning. It’s a geologic inflection as powerful as the alignment of mountains, seas and planetary wobbles that tilted the Pliocene into the cycle of ice ages that defines the Pleistocene. The era of the ice is also our era. We are creatures of the Pleistocene as fully as mastodons and polar bears. Early hominins suffered extinctions along with so many other creatures as the tidal ice rose and fell. But humans found in the firestick an Archimedean fulcrum by which to leverage their will. For tens of millennia we used it within the framework bequeathed by the retreating ice, and for more than a century we have been told that we thrived only in a halcyon age, an interglacial, before the ice must inevitably return. Gradually, however, that lever lengthened until, with industrial fire, we could unhinge even the climate and replace ice (with which we can do little) with fire (with which we can seemingly do everything). We can melt ice sheets. We can define geologic eras. We can, on plumes of flame, leave Earth for other planets. It seems Eiseley was right. We are a flame.